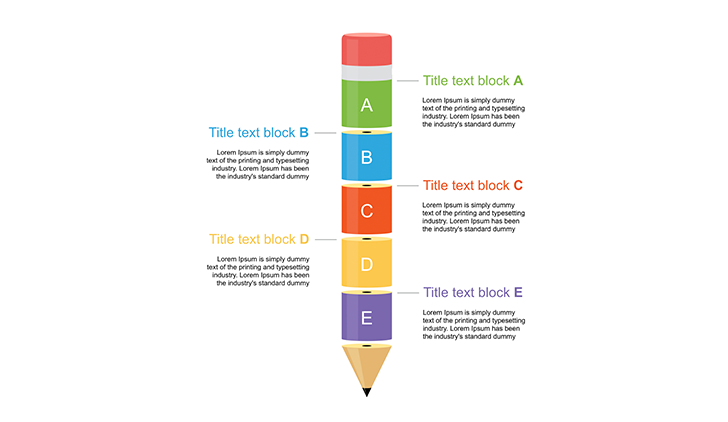 5 Levels 3d Pencil for PowerPoint - Free Download Now! 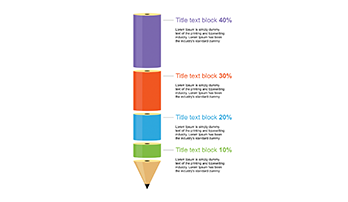 What is the slide with 3d pencil for PowerPoint for? On our site, we offer a wide range of multipurpose unique elements for your blogs, presentations, web pages. 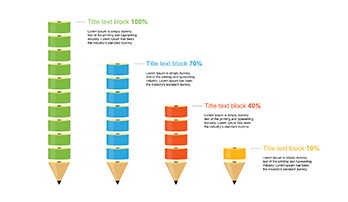 This page is devoted to 3d pencil for PowerPoint template. On the sample, you can see the pencil divided into five multicolored blocks with alphabetic enumeration. Five text blocks are scattered on the slide. Attract the attention of users, visitors, listeners. The slide is popular among office employees who often make presentations and prepare speeches. The managers whose responsibilities include projects creation are fond of our premade unique elements that help them to visualize information and create professional presentations. High quality. High quality of our templates is an obligatory feature. We provide only approved elements for our clients. This pencil won’t have defects (such as blurred segments or visible pixels) so you can display it on any devices without fears. Besides, a high-quality professional slide will demonstrate your skills and impress the visitors/ listeners. Therefore, this slide with the pencil will become your image-maker. Free download. 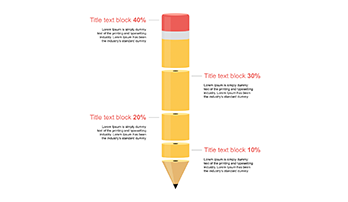 If you want to get free infographic templates, draw your attention to this element. It is one of the free slides represented on our slides. Do not waste time and download it right now! Built-in tools. This template with the pencil is equipped with a full set of built-in tools necessary for your efficient and quick work. Due to these tools, all vector elements are absolutely editable. Multipurpose element. This template can be added to any marketing, business presentation, school projects, sites, and blogs. Easy-to-use ready-made slide. All employees and internet users who have tried this 3d pencil for PowerPoint prove its efficiency and convenience. A premade unique slide is able to simplify responsibilities. To work with this template, additional computer knowledge is not obligatory.